MEAC teams coming on strong. It’s been nearly two months since Florida A&M and Texas Southern met in Tallahassee to kick off the HBCU football season in late August. A lot has transpired between then and now, so let’s check out where we are. 1. North Carolina A&T (8-0, 5-0): I got a chance to see these guys first hand on Saturday against BCU and came away very impressed. The running game is solid and the passing game was solid despite Lamar Raynard only being able to hook up once with star receiver Elijah Bell. A&T’s defense got caught napping a few times in the passing game, but they made big plays when it counted and so A&T remains the team to beat in the MEAC. 2. Grambling (7-1, 6-1): Grambling, slowly but surely, is starting to resemble the team we thought we’d see all year. DeVante Kincade has eight touchdowns to just one interception in his last three games and the defense continues to show flashes of dominance, including an impressive showing against SWAC East favorite Alcorn State on Saturday. 3. Hampton (5-2, 4-0): HiU makes its debut on the list after holding off a fierce rally attempt by FAMU to remain perfect in MEAC play. 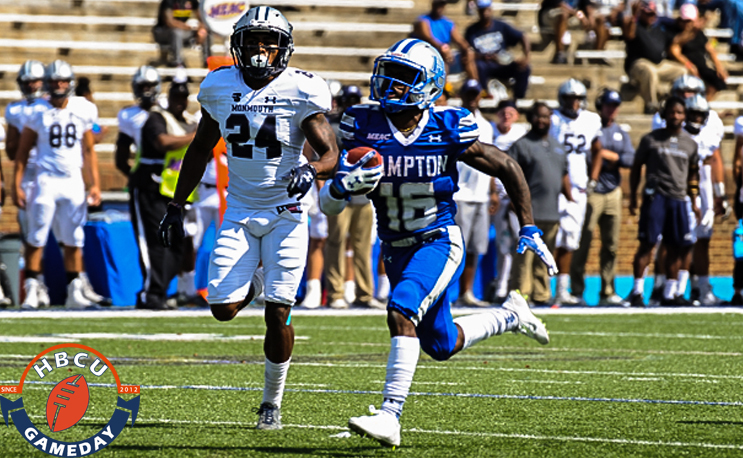 Hampton doesn’t do anything spectacular (they don’t lead the MEAC in any team stat) but they do most things well, and they continue to find ways to win. 4. NCCU (5-2, 3-1): NCCU’s streak of beating MEAC opponents was bound to happen sometime thanks to the laws of gravity. Norfolk State’s 28-21 win handed the program just it’s fourth conference loss since Jerry Mack took over in 2014. 5. Howard (4-3, 3-1): The new-look HU squad finally gave its fans something to cheer about at homecoming, beating Morgan State 39-14 for its first Homecoming win in three years. We’re almost in November and Howard still has a shot at the title and a Celebration Bowl appearance. HELLO 2017! 1. Virginia State (7-0, 5-0): VSU did what it needed to do against Lincoln, which was pretty much just show up, winning 73-21. VSU has scored 40 or better in five of its seven games this season, including its last four in a row. Though its trip to Salem, VA isn’t booked just yet, it is in the driver’s seat right now. 2. Bowie State (7-1, 4-1): How would Bowie State respond after suffering its first loss of the season? It showed that the distance between itself and the next best team in the CIAA North, Virginia Union, was pretty sizable. Now it gets a chance to see how many times it can go to the well against Lincoln and hope that VSU stumbles at some point in the next two weeks. 3. Langston (6-0): Langston faced a challenge in no. 23 Arizona Christian last Saturday, but managed to come away with a 21-20 win to stay perfect as it continues to make a run for the NAIA title. 4. Tuskegee (6-2, 4-0): ‘Skegee may not get any love from the D2 football folks, but their SWAC wins are certainly recognized here. Central State is next on deck for homecoming this week. After last year’s heartbreaker to Kentucky State, you can believe it won’t be taking its opponent lightly this time. 5. Miles (5-3, 3-1): It’s been a streaky season for Miles so far, but things appear to be hitting their stride. Miles has won three in a row and put itself in a position to win the SIAC West if it wins out, as its showdown with Tuskegee looms. However, if they find themselves overlooking Clark Atlanta, who knocked Albany State off this list, that could all change by next week.